Yes you read right – KETO caramel slice is here! 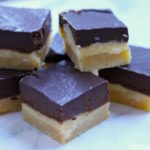 I have been searching for a recipe for a keto caramel slice since I first started on keto a few years ago, and every link I followed was a dead end. There are a few websites promising keto caramel slice out there, but every link I clicked, the post had been removed! I found a couple of recipes but they just weren’t rich and decadent enough. After experimenting with a number of different bases, caramels and chocolate ganache toppings, this is by far my favourite. 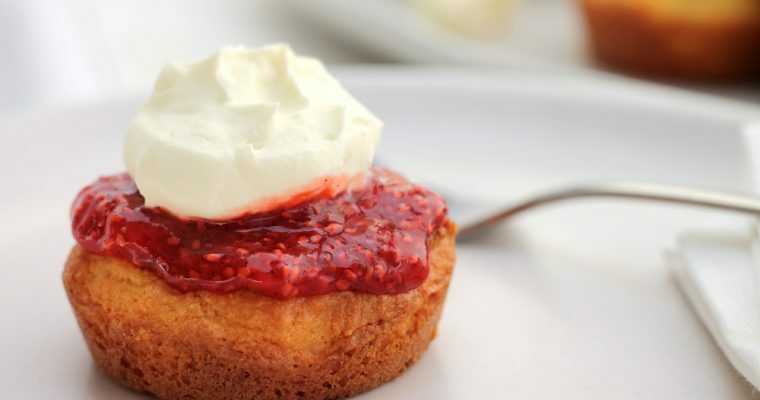 You can make this as a half recipe in a smaller baking tin as well. This might be handy if you don’t want the temptation of an ENTIRE tray of Keto Caramel Slice sitting in the fridge. As always, the quality of your ingredients is important here. I like to use Kerrygold butter (available at Woolworths here in Aus). For the dark chocolate ganache, finding the lowest sugar content is important to ensure you don’t accidentally down a bucket load of sugar. I buy this Xylitol from iherb. Cut it into small squares to ensure you don’t go crazy on them. These little Keto caramel slice squares are fat loaded and have a fair amount of almond flour and xylitol. Check out how super easy this Keto Caramel Slice is in the video below. That means this is a sometimes treat lovely people! Great to make if you are entertaining, so everyone can enjoy them and they don’t call you from the fridge all week. I keep a couple in the fridge and then freeze the rest. They are just as delicious straight out of the freezer and it helps keep the caramel from oozing out the sides… If you aren’t into that of course. I personally like a bit of oozy caramel. I just had a thought, maybe you could microwave these and serve with cold whipped cream? It would be a big gooey mess but boy would it be decadent and delicious. Note to self, try this next time! 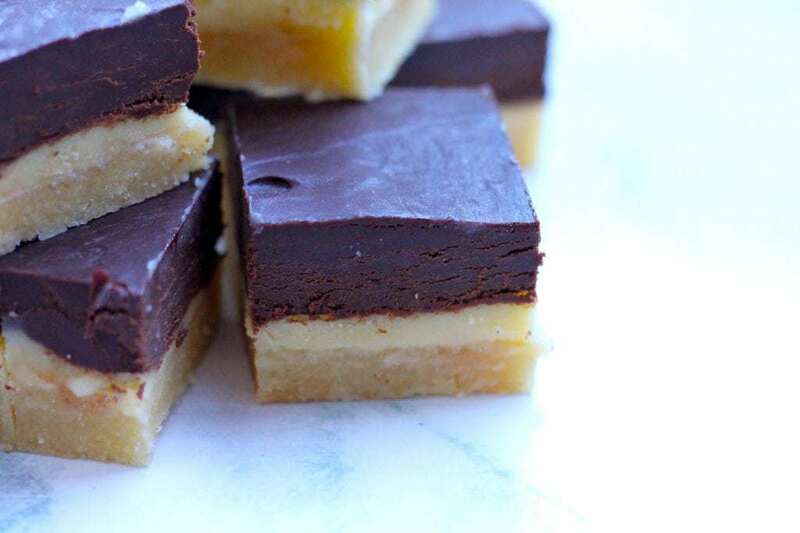 Using the lowest sugar chocolate is also important to keep the carb count down on these tasty little bites of Keto Caramel Slice. The search is over! 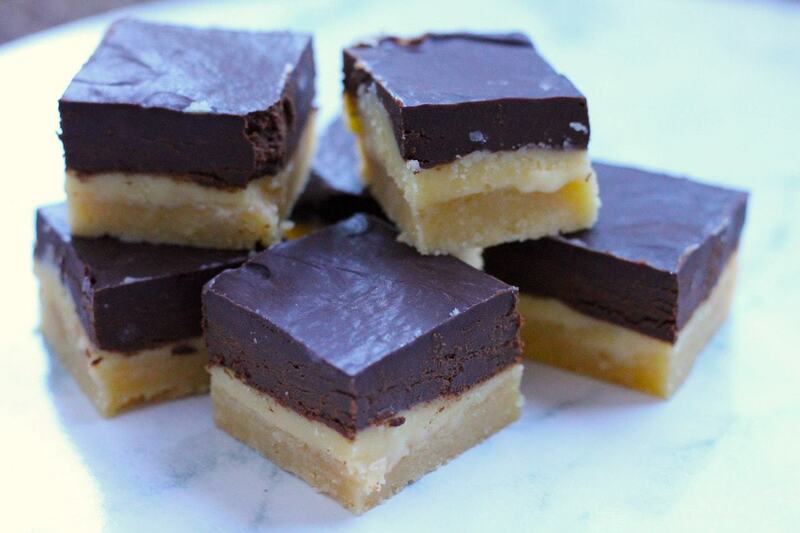 This caramel slice hits all the spots, with a buttery, biscuity base, a salty caramel and a decadent dark chocolate ganache. Combine the base ingredients well and press firmly into the tin in an even layer. Bake for 10 - 12 minutes until just turning golden at the edges. Meanwhile, in a medium saucepan, melt the butter and xylitol over medium-low heat. Continue melting, stirring occasionally, until it is a dark golden brown colour. The darker you get it - without burning - the richer the caramel taste will be. Once golden brown, stir in the heavy cream and simmer for a further 7-10 minutes until the caramel has thickened. Stir regularly. Pour the caramel over the base and return to the oven for a further 10 minutes. Once done, refrigerate until completely cool and set. Once the caramel and base is completely cooled, prepare the ganache. Chop the chocolate roughly and put In a microwave safe ceramic or glass bowl with the cream. Microwave on 50% power for 1 - 2 minutes, stirring every 20 seconds until the chocolate begins to melt. Continue stirring out of the microwave until it is evenly combined and glossy. Watch the microwave very closely to ensure it doesn't burn. Spread the ganache over the caramel and refrigerate until set. Cut into small squares. 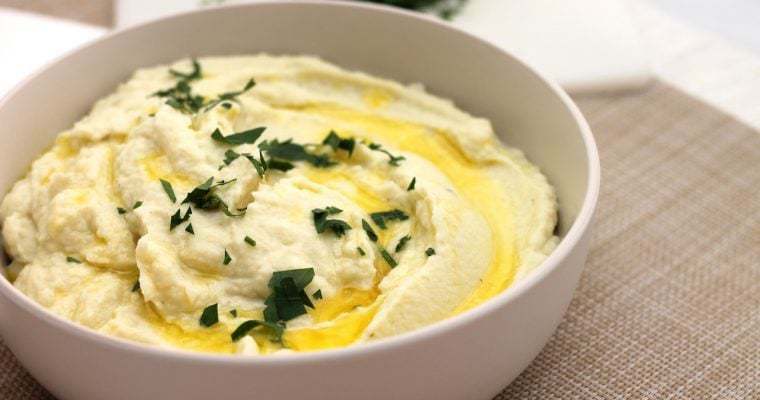 MMMMM im going to make this soon!!! If I used Lindt 90% dark choc and ad a bit a sweetener would that be oK and also lower the carb count even further? Hi Karen! Yes I would definitely use Lindt 90%. I don’t think it would even really need the sweetener as the caramel and base are quite sweet! I just made this – AAHHHMMMMAAAZING!! Used 2 x blocks of Lindt 90%, no cream. I tempered the chocolate in my thermi and poured over set caramel. Absolutely perfect – chocolate with a ‘crack’ ……… my husband said the best EVER LCHF dessert!! OMG awesome idea Kylie using the tempered lindt chocolate!! I will have to give that a go for sure. Do you think substituting xylitol for stevia would work well? Hi Georgia, Xylitol is one for one as sweet as sugar – I think stevia might be a bit sweeter? I’d look into whether it is sweeter and tone down the caramel accordingly. I also don’t know that it would dissolve for the caramel layer in the same way, another reader mentioned that there’s crystallised when using stevia. Hi hi. Thanks so much!!! this is my favourite treat now. I used erythritol instead and it worked great. A bit less than xylitol amounts in the recipe. Thanks for a great recipe. I was scared of burning the sugar, (Nativia,) and butter. It didn’t thicken.I’m not sure if it was using Nativia. I waited a long time after adding the cream around 15 mins. I did cheat and add a little cornflour and it worked well. The base and ganache were great too. I used Lindt milk chocolate, sugar free. It turned out really well. Thanks. Hi Liz, I have had other people not get the thickening effect when using different sweeteners as well, and even had this problem myself when trialling a new sweetener. It seems to be the xylitol that helps it thicken up once in the fridge! Do you use powdered or granulated xylitol? In my first effort with the granulated it wouldn’t dissolve – I was thinking it would act like sugar, so I’m wondering if everyone just uses powdered. Also, what brand chocolate do you use – would Aldi 85% be ok? Hi Ali! I use standard xylitol and it has always dissolved, but I have had one other person say theirs didn’t dissolve. I am wondering if perhaps there are some additives in certain brands. If it helps, I buy mine from The Source Bulk Foods. Aldi 85% sounds good to me 🙂 I like lindt but only buy when its on special! I know I should prob just try it out but wanted to know your opinion on the subs if it would work or not. I just made these and they taste amazing , no one would notice the difference. My base was a little bit crispy more like a biscuit so I will take it out of the oven a bit sooner next time. But amazing recipe . Thank you !! My caramel never thickened. What did I do wrong? Hmm that’s a shame Clare, this happened to me only once and it’s because I was trying a different brand of sweetener. What one did you use? It never gets really thick, but should definitely thicken up enough to pour over and cut into squares once set. I used a stevia blend with erythritol. Maybe I should use less butter? Stevie and erythritol don’t act the same as xylitol unfortunately, they don’t get that caramel melted texture which I think helps thicken it up. When I’ve tried a straight erythritol before it ended up crystallising and being pretty yucky and stevia had an overpowering taste which is why I use xylitol. It also thickens a bit more when cooling but you could try less butter as well.